Hulk Smash Toy Just $22.49! Down From $70! You are here: Home / Great Deals / Amazon Deals / Hulk Smash Toy Just $22.49! Down From $70! Hulk Smash Toy is currently offered at Amazon for just $22.49 down from $69.99 PLUS FREE shipping with Amazon Prime or for orders $25 and above! Hulk power in your hands! The RC Hulk Smash lets you control the Hulk’s vehicle with smashes, flips, spins and wheelies! Go through obstacles or knock them over with Hulk’s swinging arms. With Hulk’s awesome power, he can flip over against walls and do high speed wheelie spins. You can even adjust the arms to 8 different positions for a variety of smashing actions. Tipping over won’t stop Hulk – he’ll smash his way back into driving position. 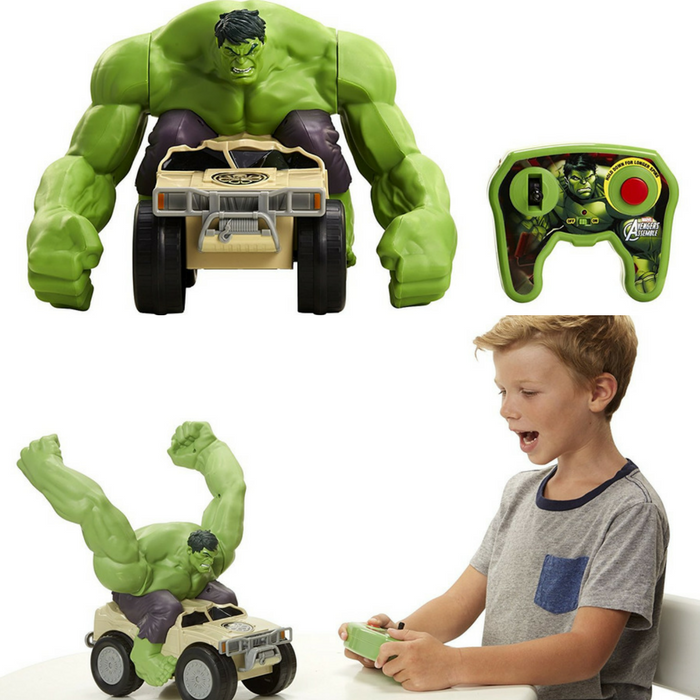 The RC Hulk Smash lets you control the Hulk’s vehicle with smashes, flips, spins and wheelies! Go through obstacles or knock them over with Hulk’s swinging arms. Tipping over won’t stop Hulk – he’ll smash his way back into driving position.